Nylon collar for dogs with applique design. Featuring plastic buckle and adjuster, satin-finish D-ring and dog and kennel pattern on green nylon webbing. To fit 20-30cm Size 1-2. Matching lead available. This product is supplied on a plastic hanging tag that displays the barcode and sizing information. The Ancol Indulgence Fashion Dog and Kennel Collar is a robust collar in earthy tones. 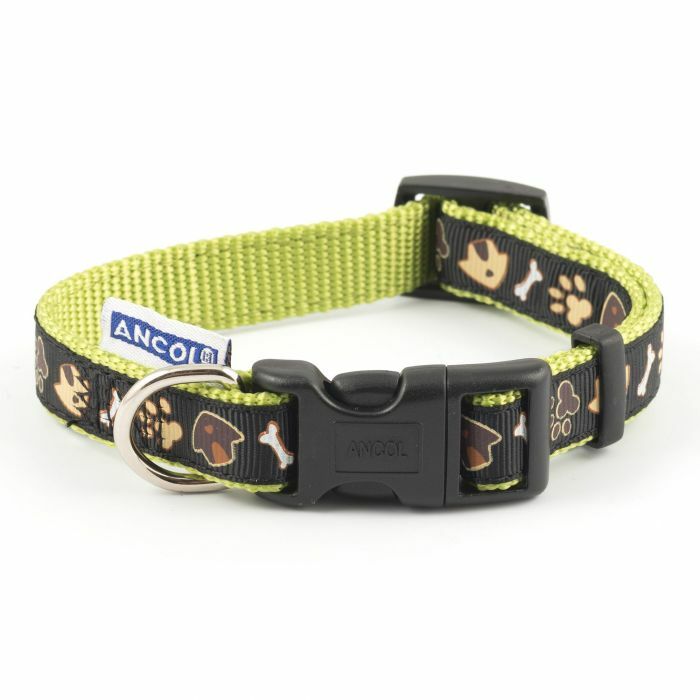 The collar's design features an applique ribbon of cartoon paws, bones, and kennels in browns and creams on a black background. This applique design is applied to a sturdy collar made of nylon in pear-green. Nylon is a strong, lightweight and weather-proof material that is durable and flexible, meaning a long-lasting collar that is comfortable for your dog. The Ancol Indulgence Fashion Dog and Kennel Collar features a quick-release buckle for speedy removal and an adjuster to ensure your dog's collar is the perfect fit. The collar also features a sturdy D-ring for easy lead attachment.